The karst mountains give way to a small town. The limestone outcrops that have ruled your panorama for the last few hours disappear from your eye line. The replacement is not as beautiful and the dreary concrete houses and apartment blocks do not rouse your imagination in the same way as the flood plain and its sheer rock formations. Your guide chatters at you excitedly while the driver of the black government-style car smiles unbrokenly except for when something slows his progress. Your guide cranes his neck around and addresses you directly. He enthusiastically informs you that this is a totally unique sight. 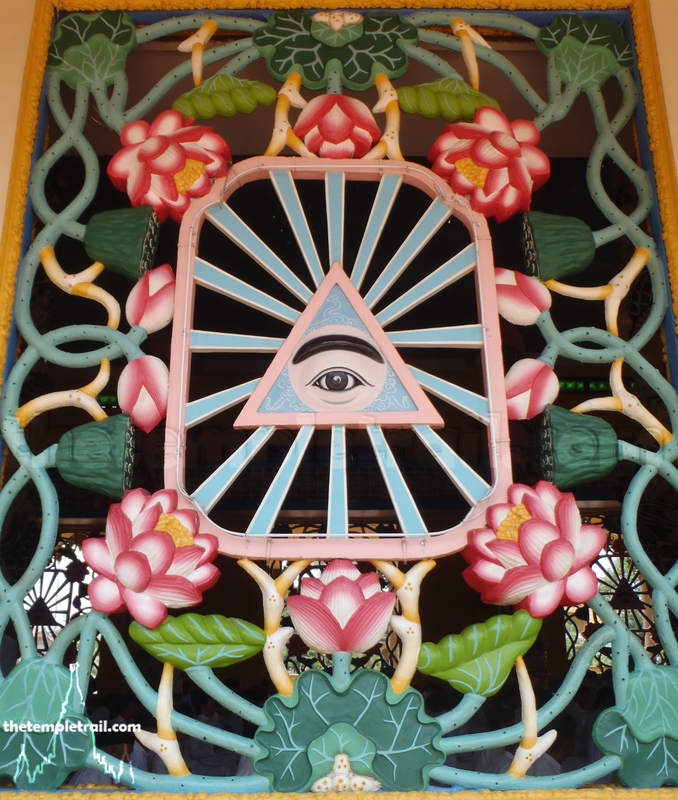 Only here in the rural province of Ninh Bình does a sanctuary of this type and style exist. His candour is contagious and you soon find yourself tweaking with anticipation. Your drive into the Kim Sơn District soon brings you to Lưu Phương Commune and its remarkable hidden treasure within the old village of Phát Diệm (shining beauty). Nothing of this identikit North Vietnamese town reveals what is concealed in its centre. The drab utilitarian architecture forms a ring around a wonderful stone complex that takes you by surprise. Phát Diệm Cathedral appears out of the blue to knock the wind out of you. Kim Sơn has been a stronghold of Catholicism since the Portuguese arrived in the 16th century. Famous Jesuit priest and creator of the Romanised Vietnamese script, Alexandre de Rhodes, lived in the area in the early 17th century. 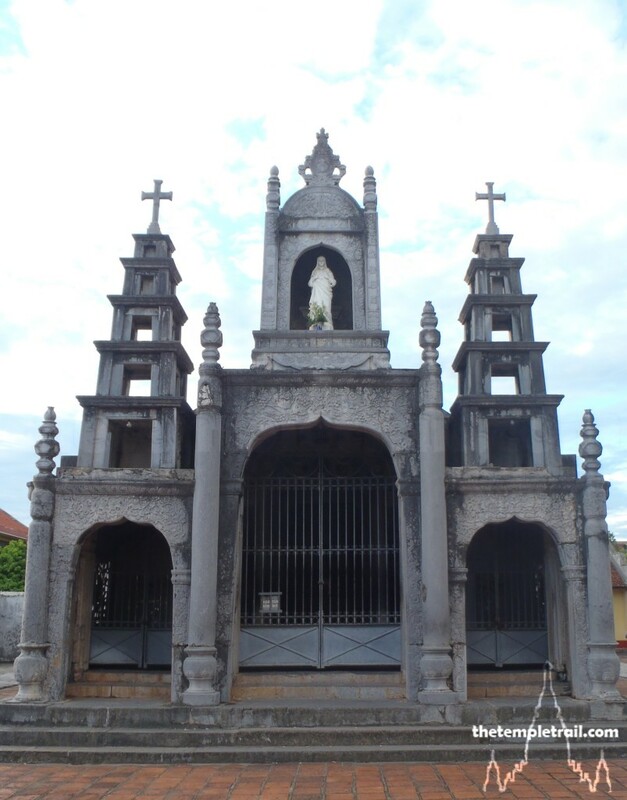 The cathedral, officially known as Nhà thờ Đức Mẹ Mân Côi (Church of Our Lady of the Rosary), is yet another landmark in the history of Roman Catholicism in the Kim Sơn region. 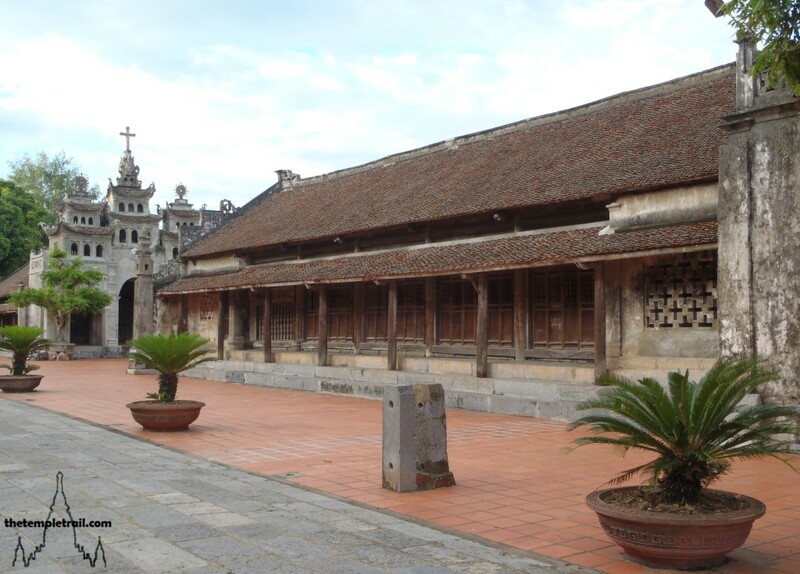 Built between 1875 and 1899 under the direction of Father Phêrô (Peter) Trần Lục, the ten-building complex is a spectacular marriage of water, stone and wood. 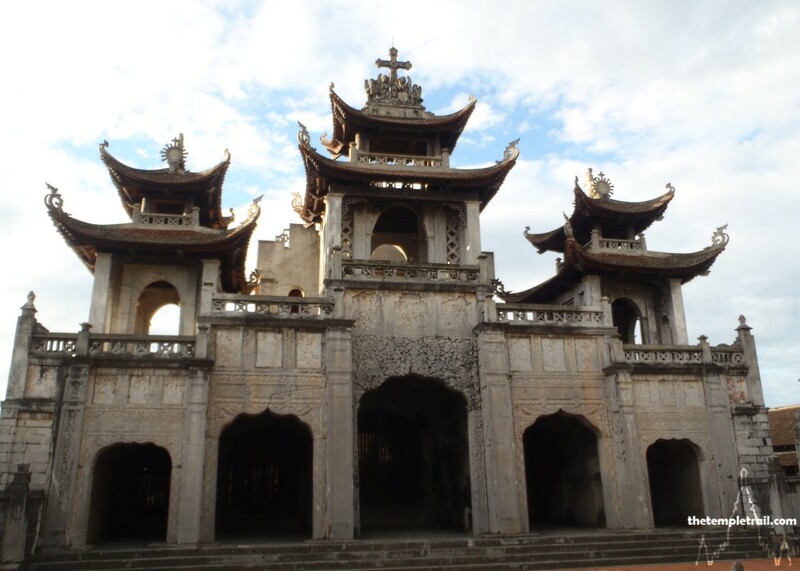 The elements of both Gothic and Vietnamese styles are clear in each of the structures. Father Trần Lục was commonly known as Father Sáu (Father Six), as he was ordained as a deacon; the sixth level of catholic priesthood in Vietnam. During the mid-19th century, Father Six was detained as a result of the ban on Catholicism by Emperor Tự Đức; a reaction to French military aggression in Vietnam. After the ban was repealed, Six returned to his diocese in Phát Diệm, and began to mastermind and organise the construction of the buildings that face you. A million tons of wood and local limestone were transported up the river and put into place over a quarter of a century by man and water buffalo alone. As Six had never been to Europe, he drew influence from his own faith and surroundings, resulting in the one-of-a-kind cathedral complex. Arriving at the Ao hồ (Lake) in the front with statue of Christ the King’s gaze beaming down at you, you proceed towards the last building to be built. Confronted by the phương đình (bell tower), you see the full glory of Father Six’s vision. The unique square building was finished in 1899; the year of Six’s death. The building is an essay in fusion. Before you, three entrances and three tiers make up the tower. Three is significant in Asian cultures as it represents heaven, earth and man. It also is symbolic of the Christian trinity. Stepping through the middle arch, under the pagoda-style roofs, you see a huge square stone slab. Each of the three arches has one, but the middle one is the biggest. The single stone is said to be the royal bed of King Hồ Quý Ly from his citadel Tây Đô in Thanh Hóa from the beginning of the 15th century. Thirteen candles adorn it and turn it into the board of Christ during the Last Supper. The slab gives you the impression of Christ and his twelve disciples sitting Vietnamese-style on the floor. The square shape of the slab is indicative of the earth in East Asian cosmology, while the canopy of the roof represents heaven above. Passing through the arch, into the first courtyard, you look back on the building to see the Latin inscription relating to the scene; Capella in Cœna Domini (Chapel of the Last Supper). The Vietnamese temple flags flutter from the top of the bell tower and from below, you can make out the two-ton bronze bell. Cast in 1892 in Vietnamese style, it is covered in Chinese characters and Latin inscriptions. The Chinese states among other things that it was made in the year of the tiger during the reign of Emperor Thành Thái. The Latin inscription describes in the first person, the function of the bell and is adorned with phrases such as ‘I summon the clergy’, ‘I mourn the dead’ and so on. In the centre of the small courtyard, you see Father Six’s simple tomb. Resting between the tower and the façade of the main cathedral building, he is in the midst of his creation. He originally wanted an unmarked grave in front of the entrance, so that people walked on it going into the church; a sign of humility in Vietnamese culture. On his death in 1899, his congregation did not follow his orders and granted him more respect with a marked stone between his newly constructed buildings. The cathedral façade is a beautiful mirror of the bell tower and has three towers and five entrances. Built in 1891, it takes you further back into the history of the complex. 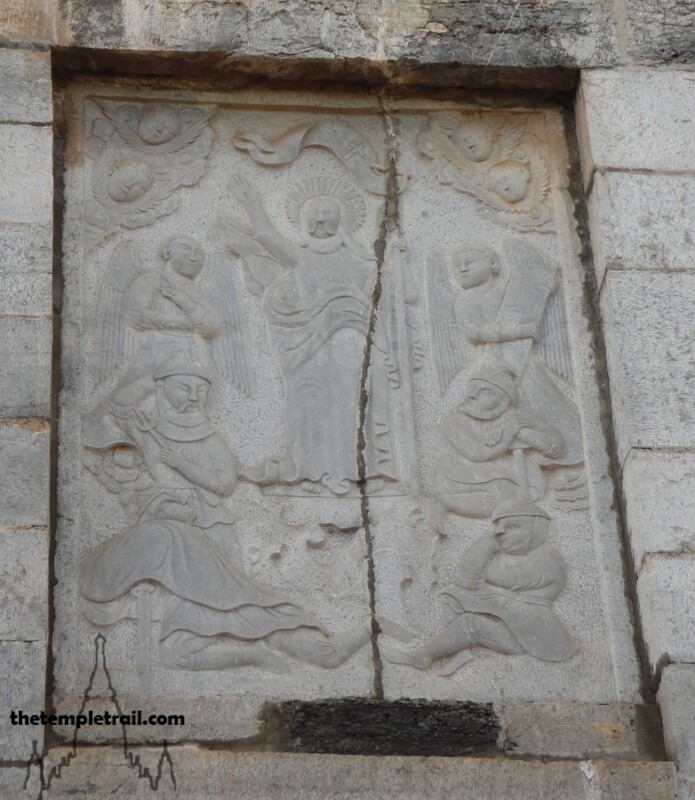 The carvings on the façade are all dressed in Vietnamese clothing and have Vietnamese faces. Fifteen metope-like stone reliefs depict the Mysteries of the Rosary from joyful (birth and life of Christ), through sorrowful (the passion and death) to the glorious (the resurrection). Seventeen angels on the outside of the building, give way to six more inside the portico, each holding a basin of holy water. Burrowing deeper into the building, your eyes adjust to the darkness. The fantastic interior is filled with the sound of hymns, as the congregation belt out songs in Vietnamese. The Church of Our Lady of the Rosary was decades in the conception and preparation. Once the foundations were lain, the structure you stand in took only three months to raise. Looking down the nave, your view is framed by sixteen enormous columns. 52 Columns hold up the four roofs of the cathedral, but these central ironwood columns are giants at eleven metres tall. Nine crossbeams intersect the roof and as you walk down the nave, they become more intricately designed. Arriving at the altar, you see the choir is lacquered and gilded beautifully and frames the statue of Mary carrying infant Jesus surrounded by paintings of saints. Above her, seven windows depict Jesus Christ the King surrounded by the six Vietnamese martyrs and at the top Mary gives the rosary to St Dominic, founder of the Dominican order. Leaving this dark, yet glittering scene, you exit back into the bright daylight through a side door to the right. Going further back into the history of the site, you come to the 1895 Jackfruit wood chapel that was originally dedicated to St John the Baptist. The pretty chapel was rededicated to St Roch, the famous healer of plagues in 1923 after a severe Cholera epidemic was stopped by invoking the saint. Taking in the wonderful woodwork, you continue on to the next chapel that lies to the south. The Chapel of the Sacred Heart was built from ironwood in 1886 and has a highly elaborate front door. So detailed is the carving, that the French wished to take it on tour to Paris, but were snubbed by the strong willed Father Six. As you circle around the main cathedral, you next come to the Lourdes Grotto. Of the three man-made mountain grottoes on the site, it is generally considered to be the most beautiful. The greenery cascades over the natural rock as the white statue of Our Lady of Lourdes peers out at the faithful. The statue was a gift from a Chinese missionary of Yunnan province. Next to the statue a tree provides shade to two priests buried in the structure. The famous gem of Phát Diệm is next on your route. When Father Six was imprisoned during the persecution of Christians, he fell seriously ill. He vowed to Mary that if he recovered, he would return to his diocese and build a church to the holy mother. The almost entirely stone church that you now see is the result of that promise. The Chapel of the Immaculate Heart of Mary is one of the earliest structures here and was built in 1883. 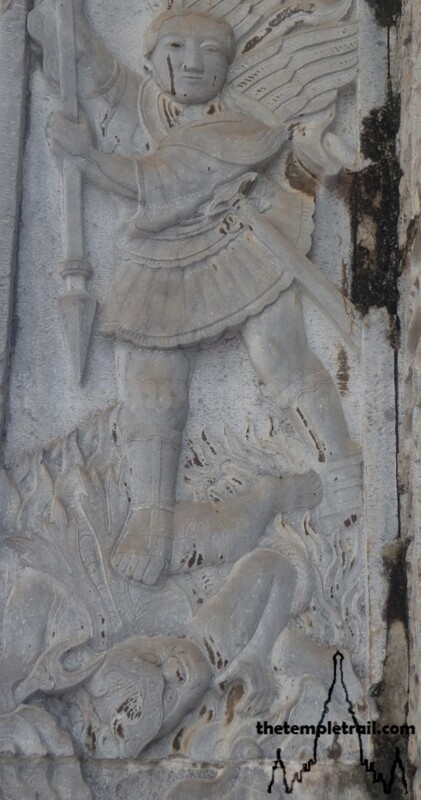 Father Six took his vow very seriously indeed and the church has the highest quality stone and carvings of any of the buildings at Phát Diệm. 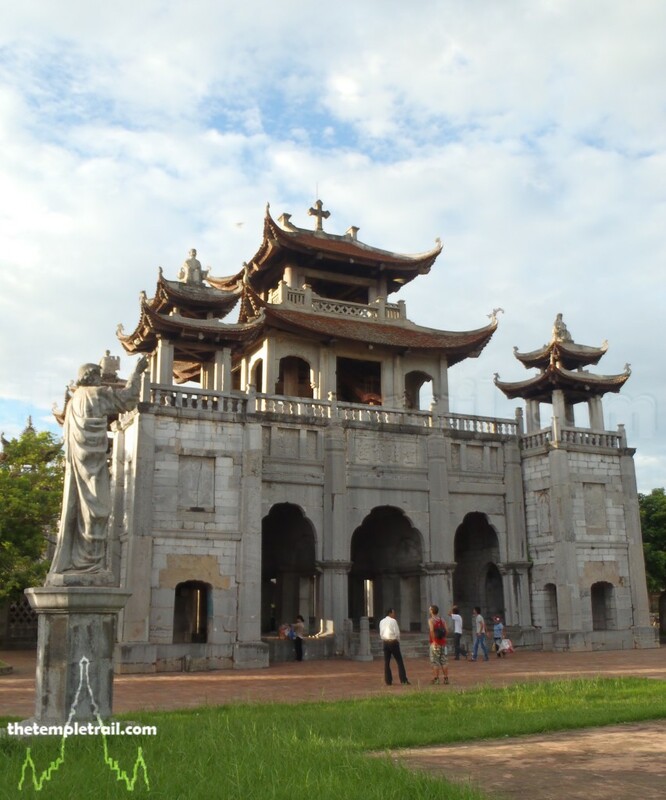 Considered to be the pearl of the complex, the façade is a remarkable fusion of traditional Christian and Vietnamese. The central tower of the three houses a statue of the virgin and is carved with Chinese characters, but more importantly, Romanised Vietnamese. It is one of the earliest known examples of the script used in stone. Either side of the central tower, are two pagoda-esque towers. The five storey turrets are directly modelled on Tháp Bút (Pen Tower) at the front of Ngọc Sơn temple on Hoàn Kiếm Lake in Hanoi. Inside, the carved details are astoundingly skilful. The interior is like that of a traditional Vietnamese temple, but the decorations are all carved from stone, rather than the traditional wood. 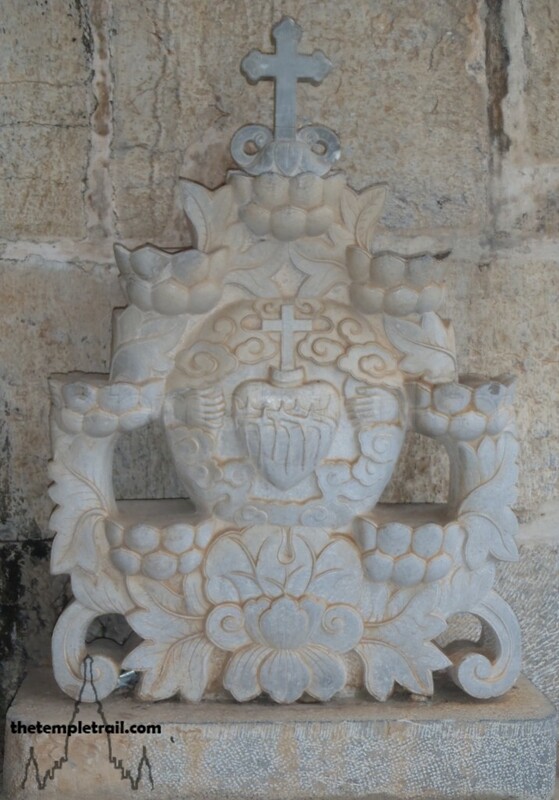 The artisans have been able to translate their craft onto the stone with immense dexterity and talent. The solid stone altar is decorated with many details, among them is a carving of the life cycle of a lotus; the symbol of Buddhism. In the centre of it is a cross. The amalgamation of these images serves to teach us that different cultures and religions can exist in harmony together. An interior wall has a yin-yang symbol carved into it, enhancing this sentiment. Walking around the church, you see a phoenix; yet another eastern concept. The phoenix is associated with the queen in Vietnam and here Mary is being shown in this role. Directly behind the church is another grotto; Bethlehem Grotto. Originally named Sepulchre Grotto this was the first structure on the site. The huge natural stones were placed to measure the subsistence of the marsh in 1875, before the construction of the other buildings. The alluvial flood plain that the churches rise from are sandy, wet and unconducive to any kind of heavy construction. From Bethlehem, you continue your circle to the third and final grotto; Calvary Grotto. 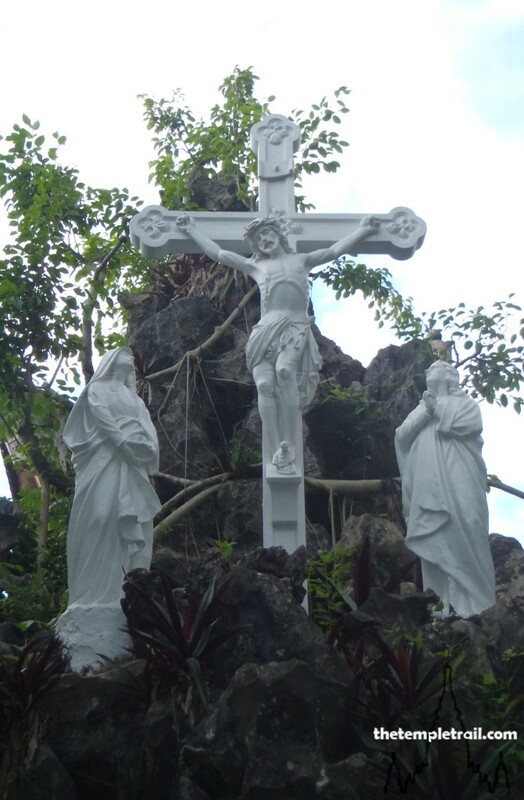 This stone structure houses the scene of Jesus being crucified and the white statues stand out strongly from the rocky hill and its layer of shrubbery. Next on your tour is the 1896 chapel of St Peter. St Peter is the patron saint of Father Six himself, so the sanctuary was of particular importance to the founder. Built from Jackfruit wood, the remarkable feature of the chapel is the set of twelve reliefs of the apostles. You come next to the ironwood Chapel of St Joseph. Also built in 1896, the building is notable for its octagonal lily decorated columns. The lilies relate to the purity of Joseph and scenes from Joseph’s life are carved into the chapel’s balustrades. Having come full circle around the cathedral and its outlying buildings, you find yourself once more looking at the bell tower in all its marvel. The holy buildings at of Phát Diệm truly are a shining beauty. They have come under attack twice since their construction. French shells damaged the roof in the war against the Viet Minh in 1953 and the Americans caused serious damage again in 1972. Both times the locals rallied around their sanctuary and made swift and unnoticeable repairs. Father Six would be proud that his vision has stood the test of time and war. He would have seen it as divine protection. Father Six achieved something special: he built houses on sand. Unlike the biblical foolish man, he managed it. Walking away from the complex and back to your car, you find yourself feeling grateful for Father Six’s lack of outside education. Had he trained in Europe, the structure might not have been such a marvel of native interpretation. The seamless fusion of East and West may not have been built for all of the world to treasure.